We remember the strangest things from our childhood - flashes of particular movies, TV shows or just random encounters at the playground just happen to stand out versus everything else going on at the time. For me, this movie was one of those quirky instances that really stood out even though I also remember being rather afraid of the movie and thus missing most of it by keeping my eyes closed in the theater. And the fact that I remember that much seems particularly significant. I've come back to this movie a few times over the years and it remains to be quite the interesting tale indeed. Of course I've also grown to realize just how dark the movie is in terms of its tone and primary themes and the fact that their entire world is being consumed by some odd representation of entropy on a grand scale. And that's pretty heavy indeed. The movie holds a lot more meaning when you have a deeper understanding of the potential concepts involved, which is natural as you grow older. It's definitely one of those movies that provides new insights as your own life experiences grow and you mature, but I doubt you could every classify this movie was anything remotely "heartwarming" and other related adjectives. The Neverending Story is a 1984 German English-language movie based on the novel of the same name written by Michael Ende. The movie was directed and co-written by Wolfgang Petersen together with writer Herman Weigel. It was reported as being one of the most expensive movies made outside of the US at the time. The movie first introduces us to Bastian (Barret Oliver), a young boy whose main passion is reading and whose main challenge is confidence. He is continually harassed by a group of bullies while at school while at the same time dealing his grief over the death of his mother. While being chased by the bullies, he stumbles into a bookstore run by the rather surly Mr. Koreander (Thomas Hill). While being accosted by Mr. Koreander, Bastian notices an unusual book that Mr. Koreander warns is not meant for him given how it's not a safe book. But this drives Bastian's curiosity even further so he liberally borrows the book with the promise of returning it once he's done. Then we go into the world of the book - this being Fantasia. The realm is under threat by a mysterious force that residents can only refer to as "The Nothing", and it threatens to destroy all of Fantasia sooner or later. Various creatures from different parts of Fantasia find themselves as odd companions in an effort to continue to avoid the Nothing while venturing to see the Childlike Empress (Tami Stronach) in her Ivory Tower, but it turns out she is already deathly ill. But she has called for the great warrior Atreyu (Noah Hathaway), who turns out to be a rather young boy more or less the same age as Bastian. Thus now it falls upon his shoulders to find a way to defeat the Nothing with only AURYN, the magical medallion, to guide his way. And the whole time Bastian reads along with Areyu's epic quest until he starts to realize why the book isn't exactly safe. It's strange how dark this movie actually is now that I think about it. It doesn't mean that it isn't safe for kids, but it is a movie that doesn't exactly have sunshine and cherry blossoms all throughout either. They are in fact fighting an intangible force called the Nothing for crying out loud - how does a young mind define that kind of a monster? How does one fight something that doesn't have a physical form apart maybe for the dark clouds that seem to mark its coming? And thus that makes for some good storytelling right there. It's funny how what I most remembered from this movie as a kid was the sight of Falkor (Alan Oppenheimer) flying through the sky with Atreyu on his back. But after re-watching the movie recently, I know realize how little that actually happened in the movie. I guess it's just the quirk of how childhood blows up certain memories above all others. And that's not necessarily a bad thing. The achievements that they made with the movie in terms of the production was pretty spectacular, especially given the time period the movie was made. To create a fantastical world like Fantasia is no easy feat by any standard, what more without the benefit of modern special effects and CGI. And yet with well-done matte paintings, scale models and fantastic costumes, they really managed to bring the world and all of the colorful characters within it to life. As much as the story is a complex one (and one that deviates from the original book in a number of ways) it is still told at a pace where I'm fairly certain most viewers, even children, can more or less pick up the story. Sure they'll be distracted by Falkor flying through the air or the darker beasts in the shadows, but the story will still be there. And that's fundamentally the story of a boy who learns more about himself through the magic of reading. And that's a tale worth sharing with any child. 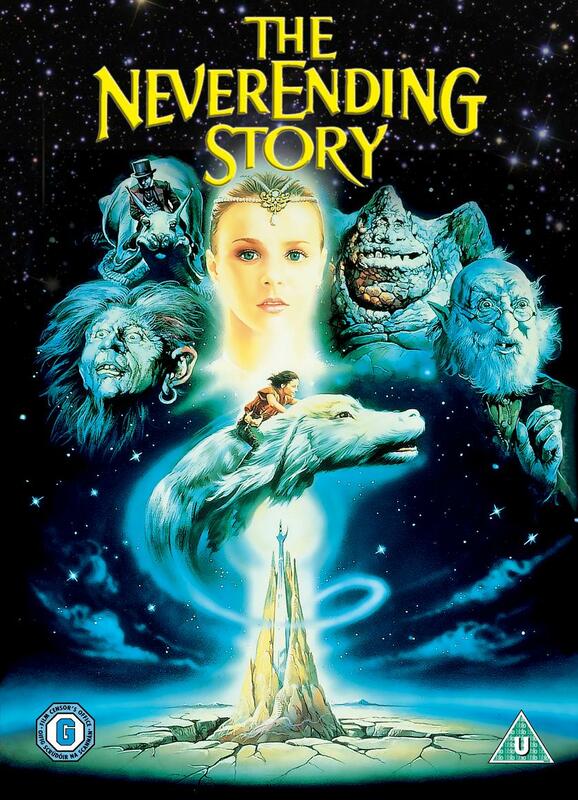 The Neverending Story isn't necessarily a perfect movie nor is it one that will sit well with every viewer. But it's still a great story at heart and one that should be shared and enjoyed proudly. Thus the movie gets 4 sad moments like that moment with Artax in the swamp out of a possible 5. I love this movie. I think there was a time on FB that I mentioned to you how often I recited the Childlike Empress' final lines to Bastian. :P I read the book when I was (much) older, but the movie has always had a special place in my heart. One thing I remember most is how I found it difficult to believe that the story could be as much Bastian's as it was Atreyu's. In my mind then, Bastian was just a spectator/narrator and couldn't be anything else. How times change, ano? I remember that comment - always nice to celebrate the movie with fellow fans. As always, I have mixed feelings about the news of a reboot movie.